Joe Walsh is not a stranger to success. Throughout his career he’s been a part of five successful rock bands: the Eagles, the James Gang, The Party Boys, Barnstorm and Ringo Starr and his All-Star Band (Hey, we didn’t say he’d been a part of the 5 best named bands). Besides these highlights in his career (his gig with the Eagles landed him in the Rock and Roll Hall of Fame) he has also enjoyed a huge solo career and just all around favor in the music scene. Rollingstone labeled him the 54 best guitarist of all time. And there are a lot of guitarists out there in case you didn’t know. 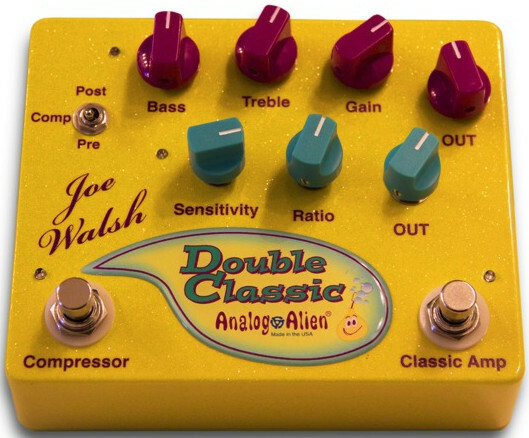 Throughout all these years of making music, playing guitar and recording songs by the bushel, the one thing that Joe Walsh had never done, was lend his name to an effects pedal. Until now. Recently, Analog Alien (the same crew that brought you the Twister and the FuzzBubble 45) announced that they had teamed up with Mr. Walsh to create the Joe Walsh Double Classic. – a mutli-effects pedal that has compressor and a classic amp tones. The compressor part of the pedal gives you a rack mounted experience while allowing you to control the dynamic range of your instrument. This ‘side’ of the box gives you three controls, sensitivity, ratio and output. The sensitivity is similar to a threshold control on studio compressors. It gives you the ability to adjust signal level at the input stage. This comes in real handy when trying to adjust for active and passive pickups. Ratio allows you to adjust the compression levels directly. You can adjust from 2:1 to 10:1. This flexibility really allows you to get smooth and natural sounds regardless of what level you are playing at. Finally, the output knob – which is sometimes referred to as volume. The classic amp side of this pedal has 4 knobs – bass, treble gain and output. We know what output does and I’m pretty sure you can guess what bass and treble are for as well. In this particular case, treble is going to cover the mid and high frequency range. The gain can start out low and give you a nice warm fuzzy feeling and grow into a gritty distortion. This amp never gives you a true, over-the-top fuzz tone. It’s about maintaining the tone of your guitar with a bit of edge and bite. In the true Joe Walsh style. Finally, the pedal has a pre/post switch which lets you place the compressor before or after the amp. Good thinking on that one Aliens! You know the drill. Let us know when you get close to one of these new boxes and leave a review at Pedal Finder. We’d really appreciate it. 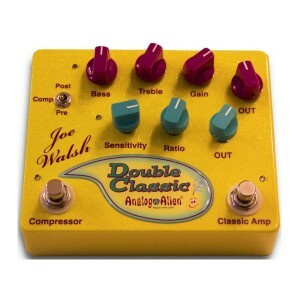 No demos yet of the Joe Walsh Double Classic, but if we find one, we’ll be sure to post it.